WOW!!!!! I don’t know where to begin. You are amazing! The students and the teachers are still talking about your session. Y.E.S. would not have been a success without you! These are the words from the middle school counselor De’Anna Caldwell- Edwards at Buchtel CLC for brothers participation in their Youth Empowerment Session held October 30, 2014. The program designed to raise awareness in students in effort to make them accountable for their actions aligned with our Project Alpha initiatives, focusing on branding your peer relationship- dating, risky behaviors, STD’s, etc. The 7th grade session led by Brothers Daryl Brown and Tony Brown with support from Brothers Marcus Mariner and Marki Johnson consisted of six, 40 minutes classes where the students and presenters engaged in open discussions about how they see themselves vs. how others seem them and how their actions lead to these perceptions. 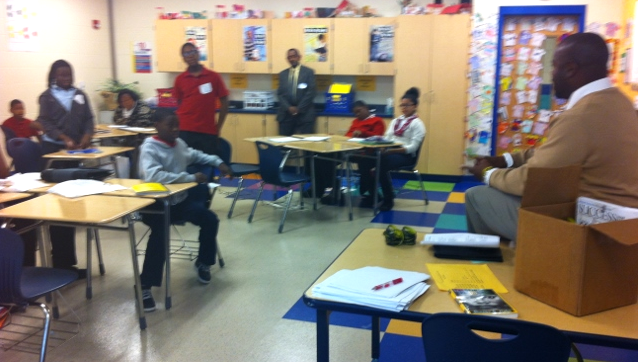 The students were very open in their discussion with thoughtful questions and answers. The students and classroom teacher (Ms. Curry) thanked the brothers for their participation and asked that they come back and also asked to participate in any programs we have outside of the school that deals in mentoring.